Life and death are inextricable in nature. The raven is a scavenger who feeds on dead things; moths consume and destroy; fungus thrives upon decay. I developed this image in preparation for the Raven King’s Ball and the associated Faery Fayre. The event is a homage to the characters created by Susanna Clarke, in her wonderful novel, ‘Jonathan Strange and Mr Norrell.’ In the world she has created, there is a sort of wild magic associated with nature, the English landscape and fairies, as well a bookish magic, beloved of human magicians. 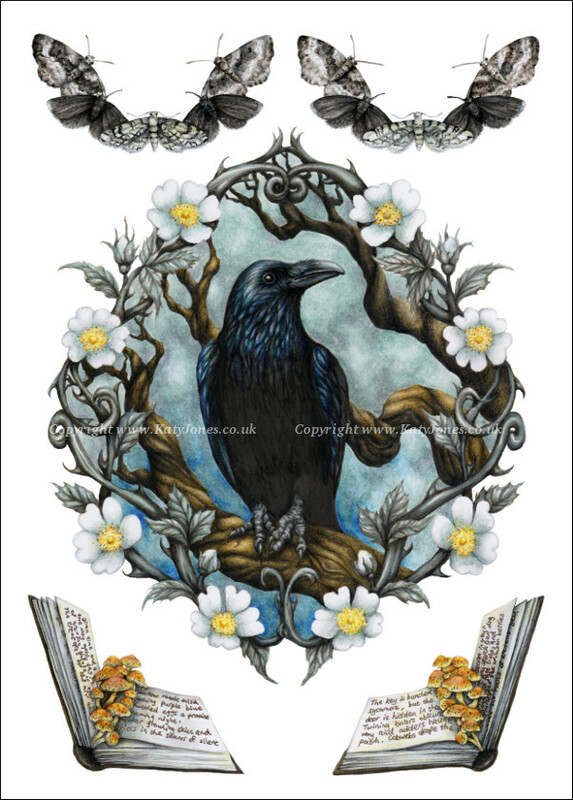 I have used some of these elements in my raven picture, and have tried to give it a similar atmosphere to Susanna Clarke’s novel. Since the novel is set in the Regency period, I was also influenced by the decorative art of that time.